Yesterday on QUILTSocial I showed you how wonderfully WonderFil rayon threads look when thread painting on photographs printed on fabric. 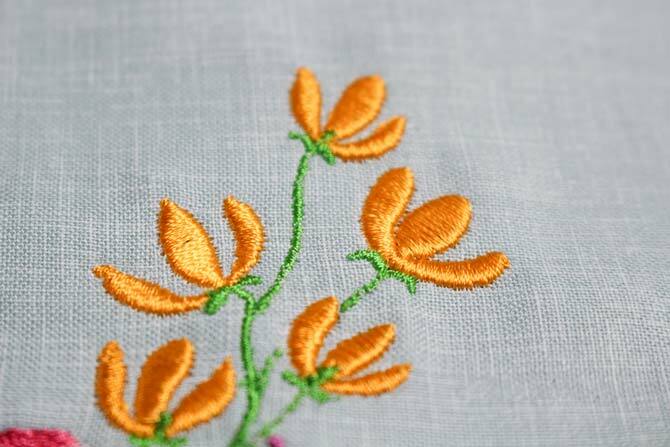 Today I’m going to show you how nice they work for machine embroidery. 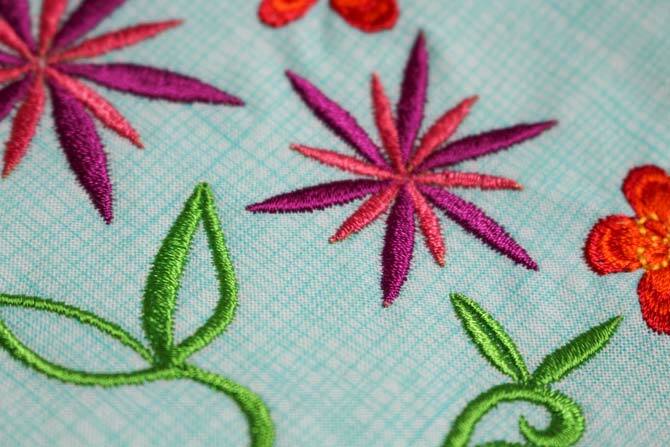 I recently had the opportunity to use a couple of different embroidery machines to experiment with these rayon threads. When I visited with my first friend, we spent some time playing with her new embroidery machine. We chose 3 simple designs and combined them into a lovely floral arrangement which I knew would give the rayon threads an opportunity to shine. For the different samples, I tried to choose thread colors as similar as possible in each of the three weights of thread. 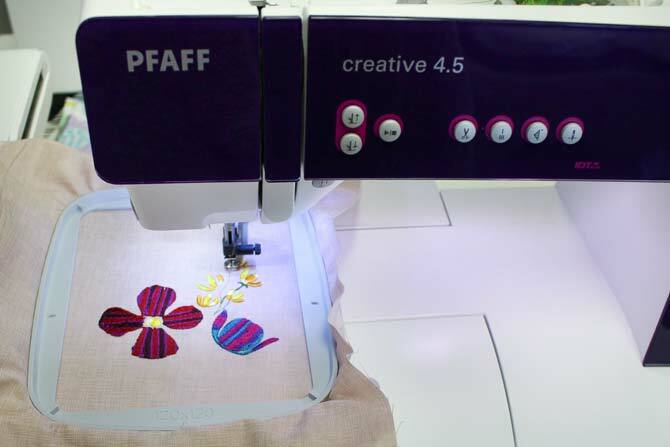 My second visit was to a friend with a PFAFF Creative 4.5. Again, we had fun choosing a simple design that would show the thread well so that we could easily compare them. I started with WonderFil’s Splendor. The 40wt rayon thread is available in three sizes and with over 300 colors, there’s a great variety to choose from. 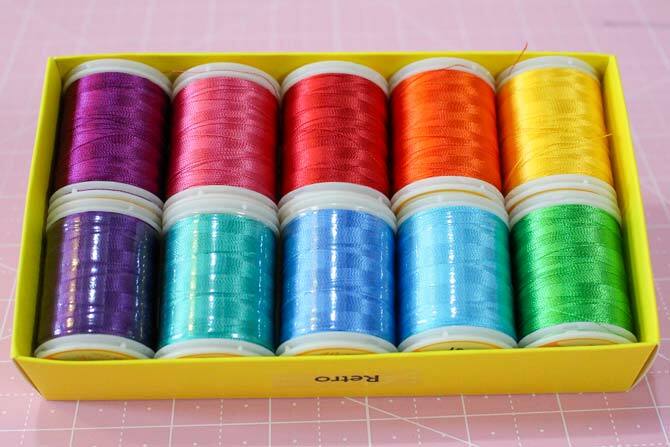 WonderFil has a number of theme packs of ten spools of thread. I chose to use the Retro pack as I just loved the colors. The solid colors of the threads show up in the design quite nicely. Here are a few of the samples that were stitched with the Splendor Retro Pack of thread. My next stitch out was with Mirage. Mirage is the 30wt thread and is available in random dyed variegated colors. I love how the colors change and how every color segment is a different length as this adds lovely texture to the embroidery. Because the thread is a bit thicker, the design stands out from the fabric a bit more than with the Splendor. 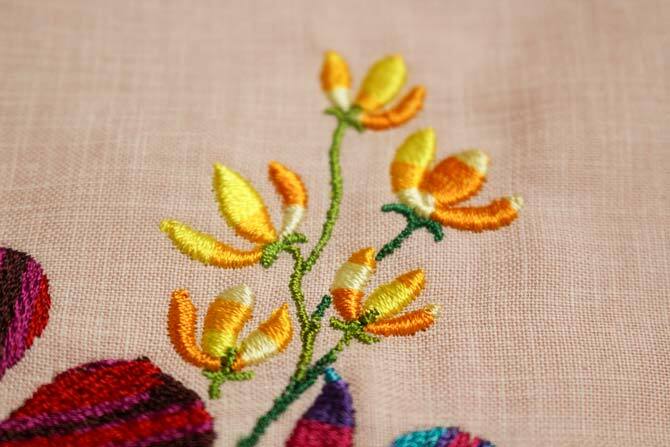 The final embroidery stitch out was with Accent. Accent is a 12wt thread and is available in solid as well as random dyed variegated colors. For my samples I combined both of the solid and variegated threads. 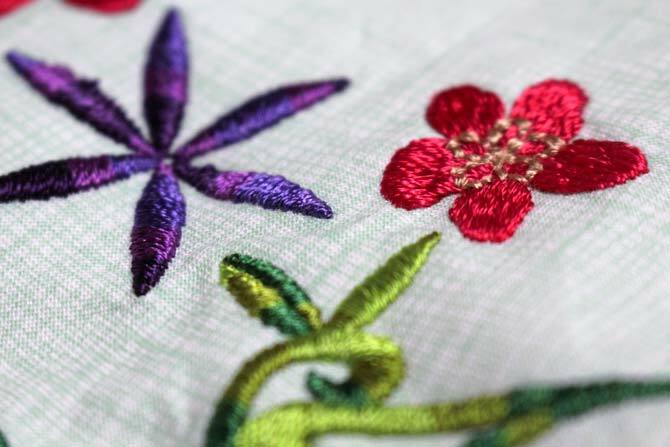 The bottom line for machine embroidery is to use the weight of thread that you like the most! I love the 40wt Splendor thread for most of my machine embroidery. 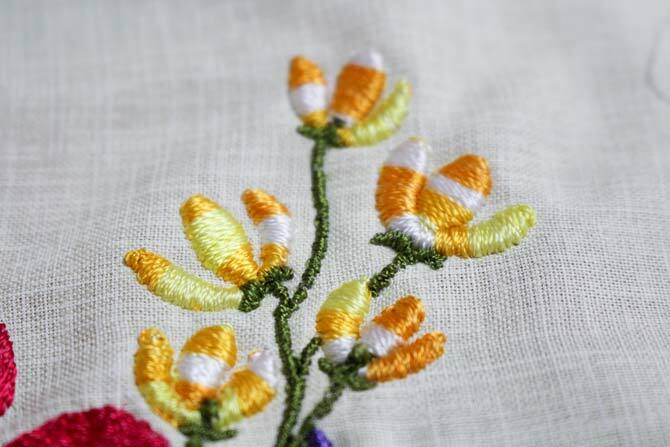 It gives a lovely satin stitch and with the huge number of different colors that WonderFil has in their line of Splendor thread it’s easy to do some lovely shading! I’ve always liked using the great colors of 30wt Mirage thread for my machine stitching. I think for embroidery though, that I would choose designs carefully to make sure that I liked how the variegation stitched out. Despite being a very thick thread, the 12wt Accent thread still looks great as an embroidery. I’d use it when I want the embroidery to really stand out. Again, I would pay special attention to where the color changes occur. I love that I can combine solid and variegated colors for even greater effects! 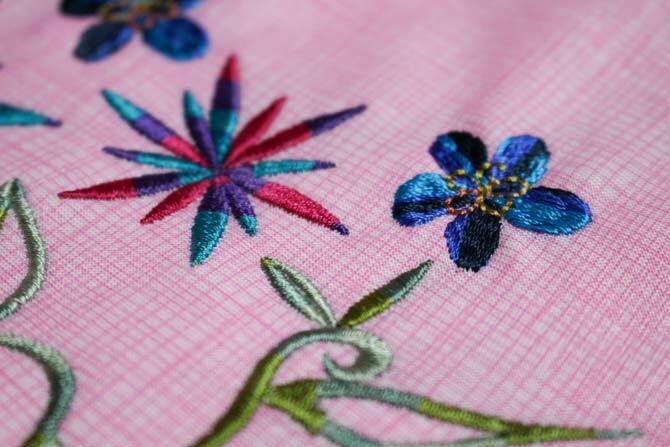 Using a wide satin stitch looks fantastic! I’ve had so much fun experimenting with these wonderful threads to do machine embroidery! Be sure to check out my post on Friday where I’ll show you how to turn these lovely stitch outs into great little cosmetic bags.